As I was researching through film music in many of WWII and pre-WWII propaganda films from various nations, I noticed a peculiar thing. 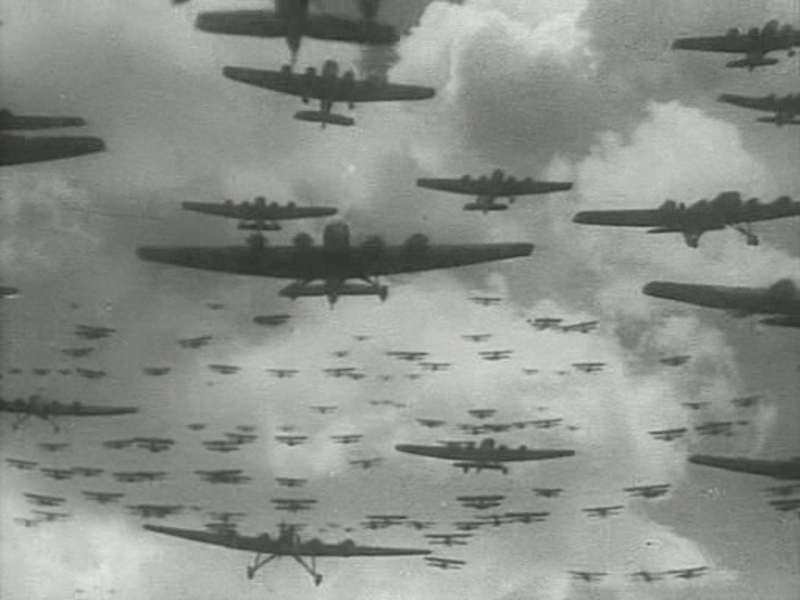 Each film has its unique treatment of sounds of aircraft. This is the opening from “Aerograd (1935, U.S.S.R. )“, directed by Alexander Dovzhenko. Dmitri Kabalevsky, one of the most prominent composers during the Stalin era, composed the film music. I am extremely fascinated by the film’s overall sound design. During the opening, the sound of a light bomber aircraft (Polikarkpov R-5) was engineered to “drone” over whole edits. This creates an interesting effect, as the sound dominates the air, and the vast land underneath. Over this droning engine noise, Kabalevsky’s male chorus enters, lending confident, paternalistic overtone to the landscape. The actions in the movie take place in the Far East end of Soviet Union, where people are constantlyl plagued by incoherent and illogical forces from Japan and from themselves, but the air power, an extension of political power of the “center”, reassures the order of the Union. Droning buzz of the engine expressively soothes the tension underneath. I wonder the droning sound is actually rendered or at least reinforced by contrabass string section of the orchestra. The transition from opening credits to the very first shot suggests this possibility. Replete with musical poetic metaphors, the most impressive of which were its unhurried, meditative ‘landscape openings’, the Aerograd required the solution of certain specific problems. Besides characterizing the scene of the action, creating the emotional atmosphere and commenting upon the representation, the music had to, by all possible means, reveal close affinity between the characters and Nature. Moreover, according to Dovzhenko’s conception, the music needed to become part of the sound and visual image of the film and exist in an unbreakable relationship with other elements of the screen synthesis. However, taking up the director’s lead slavishly, Kabalevsky lapsed into banal illustration. As a result, the music of Aerograd, – including its leitmotiv, the song ‘Good-bye, Mama, I’m flying to far-off lands’, written as an almost faultless imitation of a cheerful popular song – lacked the depth of philosophic and imaginative generalization of events in real life which characterized the visual solution of the film’s content. The sound engineer is Nikolai Timartsev, whose previous work includes “Vesyolye rebyata (1933, U.S.S.R., variously known as “Moscow Laughs” or “Jolly Fellows”)”, a goofy propagandistic jazzy comedy. Its sound design is also unique, though many scenes seem to suffer from inadequate recording technology at the time. The sound recording technology of the first decade of sound film, in various countries and industries – it will be an interesting topic.